2017 was a busy year on the blog as far as visits were concerned. I think it was the year of most visits to the blog and for a variety of posts. I was surprised to see which posts were the most popular and surprisingly, not all of them were book related. 2017 was also the year the I wrote the least amount of posts, 119. The last time I had fewer posts than that was my first full year of blogging in 2008. But, I would like to think that even though I had fewer posts, my content was much improved. I can tell that my writing style has changed over the years and my posts are definitely prettier. I’m so thrilled that I have a space to write and people that read it. Thank you to each one of you readers that take time out of your busy lives to read anything that interests you here in my tiny little corner of the internet. 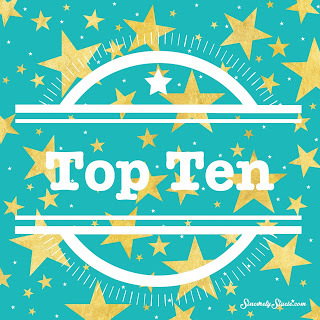 Top Ten Most Popular Posts from 2017. Every once in awhile, I have the chance to review products and this was my most popular post of 2017. I am guessing it got quite a bit of promotion from the company, but either way, it was a much-viewed post. The hammock is a great asset for readers to get cozy and read outside during the summer. Our daughter loved sitting and swinging in it. Unfortunately, I didn’t get much of a chance to sit in it last summer. I still use this water bottle today. I like it a lot and apparently, it got a lot of promotion from the company as well. I would still recommend this water bottle to anyone looking for a water bottle that keeps your water closed and has a no-spill lid. I am so fortunate to be able to promote children’s books and especially the quality books I frequently receive from Time Inc and National Geographic. They never disappoint. This children’s book got a lot of traffic on Twitter mostly because the author is Janice Dean of Fox News. But, it was also timely due to the crazy weather that was happening all over our country. It is a well-written book that gives children important information without scaring them. I often join in on book tours to help promote a new book or author. I haven’t joined in for awhile because of my schedule, but if I do join, this company is one I frequently join. The book tours with iRead are always well-organized and great books I maybe wouldn’t have necessarily heard about. I was happy to help promote their 3 year anniversary. Since this was cross-promoted and had a giveaway attached, I am sure that helped my numbers. This includes a great round-up of my favorite books including fiction, thrillers, non-fiction, historical fiction, and children’s books. Roman writes a fabulous children’s non-fiction series that I regularly feature on the blog. This particular post got a lot of visits and I’m not sure why this one over others except that it included three new additions to her series. This was a giveaway post (now closed) and also part of my promotion for Children’s Book Week so that may be why it received a lot of visits. But, also, this is an excellent series of non-fiction children’s books from Animal Planet. It’s a favorite when I take it into the classroom. Every month I share all the books that arrived over the course of that month on the blog. I’m not sure why this particular monthly round-up of books was so popular, but I’m guessing it has to do with some sort of social media promotion. A lot of times if an author sees you posting about their book, they are likely to promote it as well. It is a great round-up of books though! This book is a must-read for writers who need help navigating the publishing process. Roman and her daughter have given all the tips for those authors who may want to look into the self-publishing route. I’m even mentioned in the book as a go-to blogger! Half-Way through the winter, it’s fun to share what is helping us get through the long cold, dreary days of winter. It’s fun to shake it up once in awhile and write a different type of post. This one gave you a peek into what was going on in my life personally. It’s fun for me to look back through the post and be reminded of what was happening 9 months ago. Many other posts were very close in numbers to these and I’m just in awe that my posts are even read, let alone by hundreds and thousands of readers. I’m so thankful that I have a place to share about books, about things I love, my family, and any other tidbits of life I think you might enjoy. This blog brings me joy and I hope it brings a bit of joy to you as well. Thanks for reading!